Susan Vobejda has enjoyed a unique career at the intersection of creative, media and digital—always challenging herself to be at the cutting edge of digital innovation. Vobejda began her career in finance and at 24 she moved to Leo Burnett advertising, developing a passion for customer-centric marketing which she has applied across the media, technology, retail, fashion and content sectors. Determined to learn more about the customer-engagement opportunities offered by the internet, Vobejda chose to move from her dream job at Banana Republic in the late 1990s to join start-up Gloss.com. She continues to pursue roles at the forefront of digital marketing transformation, including increasingly senior roles at Walmart.com, Gap, Inc., Yahoo!, Bloomberg Media and CMO of Tori Burch before becoming CMO of The Trade Desk in 2017. In 2006, Vobejda joined Yahoo! and was soon promoted to Vice President of Marketing where she led marketing efforts for a growing portfolio of businesses, including HotJobs, Search Marketing and the Yahoo! Small Business brand, which included Web Hosting, Domains and Merchant Solutions. After three years at Yahoo!, Vobejda then moved to New York in 2009 to join the executive launch team for Bloomberg.com. 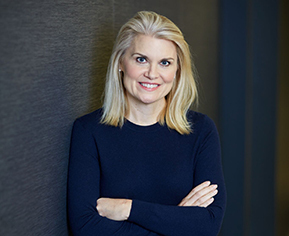 After two years as Head of Global Marketing and Business Development for Bloomberg Media Group, she was named as the founding executive and GM of Bloomberg’s Media Distribution division, the fastest growing division within Bloomberg for each of the three years she led it. In 2015, Vobejda was appointed CMO of Tory Burch, where she led a customer-centric, omnichannel digital transformation of all global brand marketing and communications. Now, as CMO of The Trade Desk, Vobejda is bringing her experience and passion for building brands in the media, technology and consumer sectors to help further The Trade Desk’s significant growth around the world. Vobejda is dedicated to helping marketers more effectively engage with customers along their entire digital journey by leveraging cutting edge technology and data insights. A visionary marketing leader, Vobejda has always been committed to developing and mentoring the next generation of marketing leaders.